Ok, admittedly not the most romantic location, but it was not intended to be a V-Day stay, it just worked out that way. We needed a half way stopping point in between New Orleans and Galveston, TX, and Lake Charles fit the bill. As experienced RVers can attest, casinos usually provide free overnight dry camping, and some have affordable partial or full hook up sites as well. Isle of Capri offers a very tight spot with electricity (no water or sewage for $20 + tax. At that price I would normally take a pass and go with the free parking lot, but they through in access to the hotel amenities, gym, sauna, showers (and pool during most of the year), so it seemed a reasonable deal. 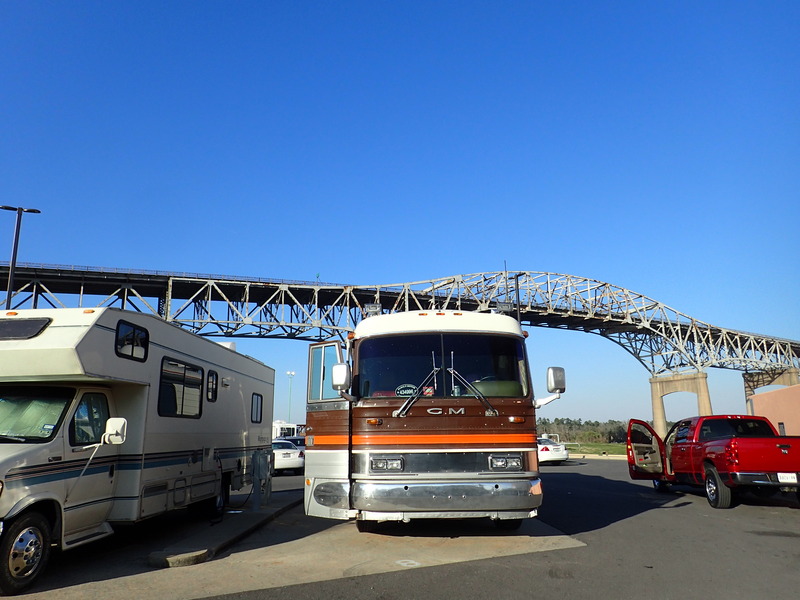 Casino parking spot, I-10 bridge overhead and neighboring RVs cozy close. Not so much. We knew going in that there would be a lot of noise through the night from the I-10 bridge over our heads, the active train tracks nearby, and the employee entrance right next door. No problem, we have ear plugs. We also didn’t mind the tight spots so much; it wasn’t that hard to get in our out, and we don’t have slide outs anyway. But the hotel amenities were rather disappointing; small and a bit unkempt, a dearth of towels and no bath products beyond the liquid hand soap at the sink. As for the casino, it was your typical slot dominated electronic hell with a cloud of cigarette smoke hanging over the facility, and our hopes for a solid and affordable casino meal were dashed when we saw the lines at the two decent restaurants. Only slightly daunted, we made the best of it! They offered complimentary beer, wine and well drinks in the casino bar and had an ample no smoking slot section. With some maneuvering we even managed to avoid the two hour waiting line at the higher end of the two restaurants through vulture like hovering near the bar. The meal was decent if nothing to rave about: one last oyster poor boy in Louisiana. The draw of this casino spot for RVers is that it is directly off I-10, less than 5 minutes from exit to parking spot, and thus it can compete with full service RV sites in casinos further off the interstate even when the price is comparable. If we ever pass through here again and need to stop for the night, I will either take the free parking rather than the powered spot, or drive 20 miles out of our way to stay at the full service and well rated Coushatta Casino Resort’s Red Shoes RV Park. They offer full hook ups, wi-fi, cable, lodge amenities, pool, game room, etc for $25 a night.